The sketches, some in color, are wonderfully crafted, and it's not hard to see how Baldridge was to progress from "Doughboy artist" to professional painter and illustrator after the war. 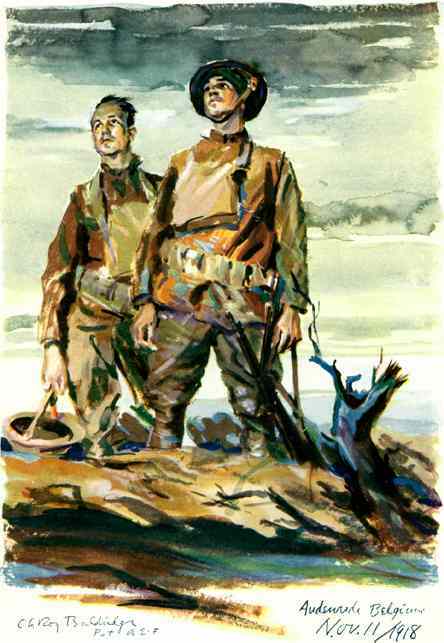 Some of our favorites include a depiction of several men caught, perhaps by a German flare, in No Man's Land; this sketch accompanies and enhances the poem "Relief". The illustration for another poem, "The Line," shows men standing in a chow line in the rain, something that seemed an everyday occurrence for the men at the front. Other sketches show Doughboys in the trenches or dugouts; one shows men advancing under fire. 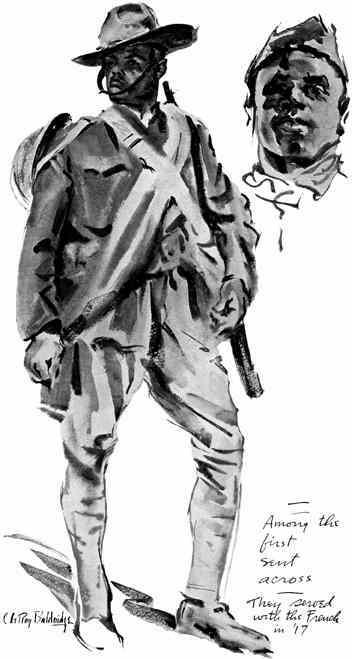 In addition to the many fine depictions of American soldiers there are some nice drawings of poilus and colonial soldiers. Some of the sketches are composites of several soldiers squatting or standing, cooking stew, or just putting up with the rain. One titled "The Lids We Wear" shows nine figures, including a nurse and an airman, wearing the various hats issued to them. Another shows the heads and headgear of five different French colonial troops, with captions partly in Arabic. Two other portraits are of several dogs, including messenger dogs, a Red Cross dog, and war dogs, all donated to the cause by local French families, we are told. One dog has given his life, or as Baldridge's caption states, "mort pour la patrie." 'Twould still belong to you!! Gee! She was a pretty kid…. Then I says: "Vous, all right, cherry,"
And my throat stuck, and it hurt. . . In the pocket of my shirt..
After scrolling through Baldridge's sketches, which are vividly reproduced here, we gain a definite appreciation of his artistic skill and a deep feeling for the atmosphere of WWI army life. Although brief, this book can give us considerable enjoyment and makes a pleasant humanistic alternative to much that is written about the Great War. Wonderful post! The poem "Madelon" humanizes the men who went overseas to fight, as well as the women who meant something to them. Cyrus Baldridge was a very remarkable man. To learn more about him you might want to look at http://tinyurl.com/CyrusLerowBaldridge.